The Toronto Ontario Temple is the 44th operating temple of The Church of Jesus Christ of Latter-day Saints. The Toronto Ontario Temple is located on thirteen acres in Brampton, which is twenty miles west of downtown Toronto. High above the gleaming white temple is the gold-leafed statue of the angel Moroni with his familiar trumpet in hand. The temple district includes Mormons who live in an enormous geographic area that has been called "the cradle of Mormonism." It covers six Canadian provinces and parts of five American states. The area includes members who come from many nations: England, Scotland, Germany, France, and Italy predominate, but there are also members from Greece, Hungary, Finland, Holland, Estonia, Mexico, Columbia, Guatemala, Nicaragua, and Poland. 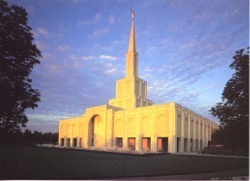 Ground was broken for the temple on 10 October 1987, and the temple was dedicated by President Gordon B. Hinckley on 25 August 1990. The Toronto Ontario Temple comprises a total of 57,982 square feet, four ordinance rooms, and six sealing rooms. This page was last edited on 23 January 2012, at 15:52.